When we are alone, it’s easy to think that we are spiritually advanced. I can watch a Hallmark commercial alone and ﬁnd myself moved to tears. I tell myself that I am a very compassionate person. But when I spend time in community with a person who annoys me, it’s amazing how quickly I experience compassion fatigue. In community we discover who we really are and how much transformation we still require. This is why I am irrevocably committed to small groups. Through them we can accomplish our God-entrusted work to transform human beings. However, experience tells us that simply meeting with a small group does not automatically result in spiritual growth. Certain practices must occur to facilitate the transforming work of Christ in us. The presence of these is what makes the diﬀerence between all-too-typical small groups and life-transforming communities of spiritual formation. What are these practices? After months looking at Scripture, reading church history, talking with respected people, and meeting with leaders of small groups, I don’t think I have the definitive answer, but I have observed ﬁve essential practices. We all wear masks. We hide from each other. It’s part of our fallenness. That is why one of the most formative practices in a small group is confession. Confession is the appropriate disclosure of my brokenness, temptations, sin, and victories for the purpose of healing forgiveness, and spiritual growth. Without confession we are a community hiding from the truth. I know what it’s like to do church with people who wear masks. I’ve attended very nice churches where people smiled, talked about their jobs or the weather, but never really removed their masks and revealed themselves. I recall one couple, pillars of the church, whose marriage fell apart when the wife ran away with another man. The church was shocked; the couple had hid the reality of their troubled marriage for years. Another woman in the church was well liked by everyone, but one day she landed in the hospital to have her stomach pumped of the poison she had taken. She was so miserable that she felt unable to face another day. And no one in the church knew. Throughout church history, whenever God has done great things, confession has been present. In the church, confession must be freely oﬀered—never manipulated. A small group serious about transformation should be moving into ever deeper confession—removing masks to reveal our core feelings and fears, sins we still struggle with, and areas where we’re not growing. We need to avoid “confession killers” in our groups. These include the inappropriate use of humor. Some people are embarrassed by deep honesty, so they may mock the person confessing or diﬀuse the atmosphere with a joke. Their comments send a signal that this is not a safe place to confess, and the masks go back on. Judgmental statements also shut down confession. I recall a small group where a man admitted his struggle with lust. That was a risk, and then someone else said, “I can’t relate to that struggle at all.” His statement shut down an opportunity for new openness in the group. 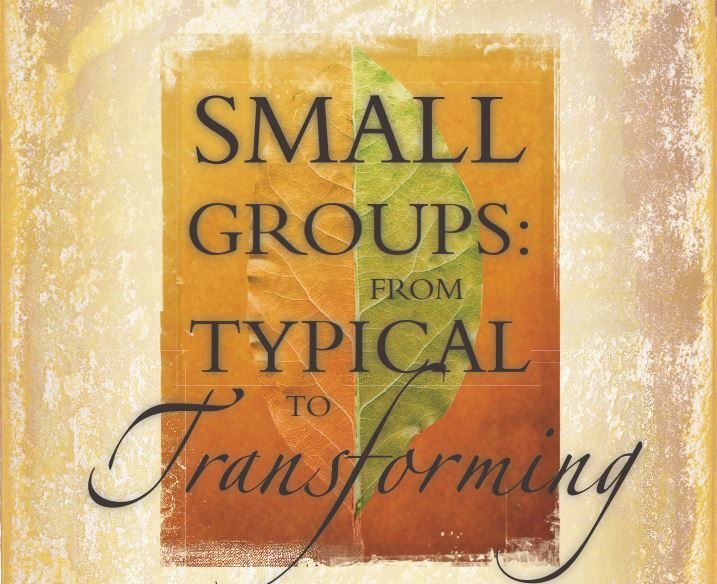 To see real transformation, our small groups must begin with reality. By removing our masks through the discipline of confession, we acknowledge the reality of who we are and open ourselves to God’s transforming work. Look in the mirror. We all wear masks. We hide from each other. A small group is a place for people to look into the mirror, discover who they are, and then ask, “How do I apply God’s Word to my life as it really is?” This is the practice of application. As a teaching pastor I am regularly astonished by people’s ability to hear a sermon, nod at it, be moved by it, write it down, and then do precisely the opposite of what they heard. This frequent occurrence shows the extent to which people need patient and careful application of Scripture to their daily lives. We may hear biblical instructions such as “be gentle,” “be loving,” “be faithful”—but how do we actually apply them to our bosses, spouses, or kids? Small groups can address this gap. Imagine someone has a problem with anger. A small-group leader should ask him, “What kinds of situations tend to get you angry, and how do you respond?” Give the individual some alternatives to sinful patterns of anger. Role-play these situations in the small group. Then next week ask, “How did it go?” If he got it right, celebrate. If he didn’t, investigate what happened, and encourage him to do it diﬀerently next time. If this kind of application doesn’t happen in small groups, it may not happen anywhere, and people will not be transformed. I have made certain commitments about food and exercise in my life, but how serious I am about those commitments is diﬃcult to determine without measuring my progress. A scale serves as a tool of accountability for me. Am I achieving my goal, or am I missing it? Ultimately the scale reveals how eﬀ ective I have been in living up to my commitments. WE DON’T DRIFT INTO DEVOTION TO CHRIST. We need to make some key decisions on our journey of transformation: What are my commitments about prayer, about Scripture, about my use of money, about evangelism, about servanthood, about truth? Keeping these commitments requires a community of accountability to serve as a scale that reveals how we’re achieving our goals or missing them. In every church there are people facing decisions about vocations, ministry involvement, finances, relocation, and relationships. Without the beneﬁt of community, their decisions may be impulsive, emotional, based on too little information. The result is too many broken lives. The small group is to be where we ﬁnd guidance, where we help each other learn how to listen to God. Small groups who rely upon God’s Spirit serve as a map for us when making important decisions. In the early church, the Spirit guided believers as a community. In Acts 13:1-3, for example, the church fasted, prayed, and listened to God. Then, in response to the Spirits guidance, they sent out Saul and Barnabas to minister. In Acts 15 the church faced a major decision about the behavior of Gentiles, and they listened to the Spirit’s guidance so carefully that in the letter explaining their decision they were able to say, “It seemed good to the Holy Spirit and to us.” (v. 28). Small groups should be places where people gather to hear God through prayer and listening. Every small-group meeting should include the question, “Is anybody facing a significant decision this week?” And in community the group should seek the Spirit’s voice for the person facing the decision. A hug is a gesture of love and encouragement. It represents what we all need from a community of transformation. We need to know that someone is committed to us and loves us. That cannot happen when we are alone, and it cannot happen in a large gathering. It’s going to happen through smaller communities. In these groups we can supply the love, encouragement, and embraces that people need to continue their journeys of transformation. A long time ago I decided to talk to someone honestly about my temptations and where I had messed up. I wanted to practice the discipline of confession. So I asked my friend Rick if we could meet. At that time, I had known him for about 10 years. Those words were so powerful. They felt so good that I wanted to make up more bad stuff to tell him. To have someone know everything about me and still love me was truly life giving. That kind of love is what we need in small groups to transform lives. We can make small groups complex and difficult, we can build the perfect small-group strategy, but if we do not have the love of Christ, we are not really engaged in transforming people into His likeness. JOHN ORTBERG was teaching pastor of Menlo Park Presbyterian Church in Menlo Park, California at the time this article was written in 2006. He is author of many books. Enter your name and email below to receive a link to your free download, plus news and updates from The Disciple-Maker. These are great insights into effective Small Group work.When we don’t know each other we cannot love the people we don’t feel their heart throb. Muchas gracias por el articulo, me ayuda y anima mucho..